My father informed me last night that his boyhood friend Winston Peters is about to hold an election rally out Franklin way, in some war memorial hall or bowls club. "Busloads of old people are coming up here from Tauranga" Dad reported. "The buses will have a reduced capacity, of course, because of all those wheelchairs and oxygen machines they'll have to fit in. And I guess Winston will have to organise ambulances to wait outside the venue, because some of his supporters are liable to collapse with excitement or fatigue." Apparently forgetting temporarily about his own advancing age, my father went on to joke about "the stroller and rest home vote", and to mock the way Winston's billboards airbrush his face to make him look younger than his sixty-six years. The global economic crisis which began in 2008 has had a fateful impact on Spain, leaving both businesses and local governments heavily indebted, and making nearly a fifth of the working age population jobless. As protesters fill the centres of Madrid and other cities, the more radical parts of the Spanish left are suddenly getting a hearing from the public. While Spain's shaky social democratic government is responding to the the country's economic malaise with measures borrowed from the political right, like cuts in the public sector and attacks on trade unions, its radical left is calling for a fundamental shift in power away from business and towards what the Occupy movement calls 'the 99%'. The protesters on the streets and outfits like the Catalan Republican Left are calling for the nationalisation of businesses threatened with bankruptcy, and for a punitive tax on the bankers who helped create the disaster of 2008. Mark Derby sees a partial parallel between the unstable political situation in contemporary Spain and the turmoil of the 1930s. Back in the '30s the radical left won massive support from Spanish workers and peasants tired of living under the yoke of a semi-feudal landowning class and a deeply conservative Catholic church. When a left-wing government was elected in 1936 the forces of reaction responded with war, but this only radicalised the Spanish people. In Moises Broggi's beloved Catalan region, workers and peasants seized virtually all the factories and farms from the old ruling class and began to run them collectively. Arriving in the Catalonian capital Barcelona in 1936, George Orwell found 'a town where the working class was in the saddle'. With the help of Hitler and Mussolini the Spanish right eventually won their war against democracy, but the memory of the radical 1930s has been kept alive by men like Moises Broggi. Who could believe that events and individuals that appear irrevocably buried in the somewhat distant past could reappear to play a part in the exhilarating present? Vote for Moises! A couple of months ago I posted an interview with Sebastien Bano about the botany, culture and politics of the Canary Islands, where he has lived for several years. Mark Derby, the historian whose works include a study of New Zealand's manifold and fascinating connections with the Spanish Civil War, e mailed me to say how much he'd enjoyed Sebastien's talk. In recent weeks Sebastien has been doing some research on El Hierro, the smallest and westernmost of the Canary Islands. The rocky, dry island was for a long time considered by Europeans to sit at one of the edges of the world. I am honoured that Mark Derby enjoyed the interview. I wonder if Derby knows about the peculiar situation of El Hierro during the Civil War. Once Franco's Nationalists conquered a region, Republicans were in big trouble. They knew they would be shot if they were caught. On the mainland of Spain, or even on Gran Canaria, the largest island in the Canaries group, Republicans could seek shelter in caves and abandoned houses, in extremely remote valleys and amongst mountains. El Hierro was the worst place for Republicans to hide, because it is so small. El Hierro also had a very limited population, where everybody knows each other (not only were there tensions on the island between Francoists and Republicans, but there was also a history of rancour between some families and clans). Despite the difficulties created by their island's small size and divided population, many Herreños showed fantastic courage in supplying shelter to Republicans after Franco's forces conquered the island. I wonder, however, how these Republicans fared in the long term. Did they carry on living in their hiding place, or did they escape to a foreign country? I imagine that leaving the country was a very difficult project even decades after the end of the Civil War, the national police had lists with the names of the Republicans and anyone who was intercepted went to jail. My grandfather was only a child when he left Spain for France, but because he was the son of Republicans he had a very bad surprise when he decided to spend his holidays in the country of his birth at the very end of the 60's. He was kicked repeatedly and punched very hard in a police station just across border from France. So I don't want to imagine the fear a Republican soldier hiding on El Hierro could have, and the difficulties he had to find freedom. We'll send you photos of El Hierro when we get back home. Sebastien's e mail got me thinking about other small islands which have been subjected to fascist rule. One of Skyler's grandmothers fled with her family from Jersey, the largest of the Channel Islands, just before a German occupation force arrived there in late 1940. After the fall of France and the Dunkirk evacuation, Churchill had decided that a few small islands off the coast of Normandy were not worth defending from a rampant German army. 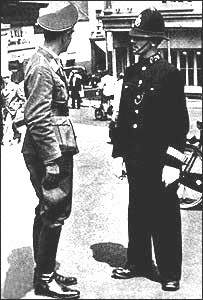 The British flag was lowered, and Jersey's local government and police force were instructed to cooperate with the incoming Nazis. The story of the Nazi occupation of Jersey and the other Channel Islands has fascinated historians, scriptwriters, and counterfactualists because it seems to jar with the notion that the British were incorrigible opponents of Hitlerism. Most of the inhabitants of the Channel Islands submitted to Nazi authority, even when the Nazis began to deport Jews and import slave labourers to help them build forts and gun emplacements. It is perhaps understandable that the small, communist-led resistance movement which did form on Jersey eschewed violent confrontation with the enemy. With its tiny size and flat, open landscape the island offered little cover for the sort of irregular force which might make hit and run attacks on the Germans, and the decision of the local establishment and much of the population to cooperate, however grudgingly, with Nazism increased the danger of betrayal and detection. The Jersey resistance did succeed in sheltering many enemies of fascism - Jews, escaped slave labourers, well-known communists - until the German abandonment of the islands late in the war. By the time that the Nazis were being thrown out of France and the Channel Islands, many Spanish Republicans were growing hopeful that their country would be liberated from Franco's rule. Thousands of exiled Republicans who had served in the anti-fascist resistance in France crossed the Pyrennes, and attempted to start a guerrilla war against Franco. But their efforts fizzled out, partly because of the alliance Franco forged in the late 1940s with America, which had decided that his regime was an admirable bulwark against communism. It is sad to imagine Republicans waiting in the basements and copses of El Hierro for a liberation which would not come. At the end of June Greece's governing party began to push another austerity programme through parliament, and came a little closer to collapse. After expressing unease at mass lay-offs of public sector workers and cuts to pensions, and refusing outright to support a law which rolled back the legal rights of unions, the long-serving member of parliament Panagiotis Kouroublis found herself expelled from her party. Kouroublis may have lost some friends in parliament, but she has become a heroine to the hundreds of thousands of Greeks who have been protesting against the austerity programme with marches, occupations, strikes, and riots. Political analysts have taken to describing Greece as 'ungovernable', and a report by the CIA suggested that a military coup might be the only way to get protesters off the streets. 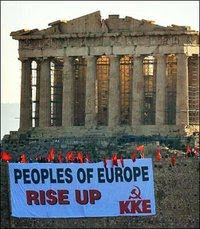 It is worth noting that the government pushing radical neo-liberal policies on an unwilling Greek working class is filled not with evil bankers or a set of emissaries from European Union headquarters in Brussels, but with social democrats. The Panhellenic Socialist Party (PASOK) has traditionally enjoyed the support of the majority of the Greek working class, and includes in its leadership many former trade unionists. But it is not unprecedented for a social democratic party to respond to an economic crisis by attacking unions, wages, and the welfare state. When the Great Depression came to Great Britain in 1929, the Labour government of Ramsay MacDonald decided to cut spending on pensions and schools, acquiesced in mass sackings of workers, and refused, despite the urgings of John Maynard Keynes, to borrow money to stimulate the economy. Businesses were delighted. In New Zealand the Labour government elected in 1984 was greeted by a debt repayments crisis and a run on the Kiwi dollar. Under the leadership of David Lange and Roger Douglas, the party responded with one of the most thoroughgoing and devastating set of neo-liberal policies seen anywhere in the world. State assets were flogged off at bargain basement prices, tens of thousands of public sector workers found themselves in the dole queue, student fees were increased by several hundred percent, and a Goods and Services Tax which hit the poor hardest was introduced at the same time that company tax rates were lowered. 'Rogernomics' was a blow from which poorer Kiwis and the trade union movement have never altogether recovered. Labour itself has never quite recovered from the Lange-Douglas era. The party suffered a massive membership decline in the 1980s, and it remains a relatively small organisation today. Ramsay MacDonald and David Lange were condemned as traitors and as lackeys of the rich by many of the grassroots supporters of their parties. Today similar insults are aimed at PASOK leader George Papendrou by the crowds on the streets of Athens and Thessaloniki. But the likes of Lange and Papendrou are not aberrations so much as expressions of one side of the contradiction which is social democratic politics. At the beginning of the 1920s, when Ramsay McDonald was promising that the Labour Party would govern Britain in the interests of workers rather than employers, Lenin wrote his famously bad-tempered book Left-wing communism: an infantile disorder in an attempt to sum up the nature of social democracy. Lenin described organisations like Labour as 'bourgeois workers parties' - that is, as parties which claim to represent workers, which have mass working class support, and which advocate some policies beneficial to workers, but which side, in the final analysis, with capitalism and the employing class. During good economic times, Lenin argued, social democratic governments can reward their supporters by delivering them better state services and higher wages. When capitalism goes into crisis, though, and profit levels have to be restored, the bourgeois workers party comes under pressure to save the system it has sworn to work within, by cutting wages and state spending, and siding with bosses against trade unions in industrial disputes. Lenin was writing before the 1930s, when a number of bourgeois workers parties, including New Zealand's Labour Party, got elected to government and implemented the sort of policies Keynes had unsuccessfully urged on MacDonald. These governments increased rather than cut state spending, borrowing money to cover rises in benefits and wages as well as public works projects designed to stimulate the economy. Keynesian policies were generally pursued because of pressure from trade unions and unemployed workers' organisations, and in spite the protests of big business and the political right. 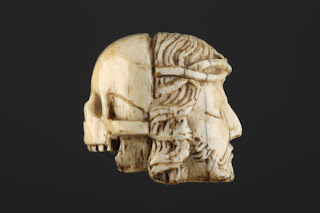 Like the Roman God Janus, then, social democratic parties have two faces. They can, depending on the state of the economy and the balance of social forces, adopt either moderately progressive or revanchist, pro-business policy programmes. Keynesianism and austerity are both aspects of the social democratic tradition. The contradictory quality of social democracy is evident in the Labour Party's campaign for November's general election. On the one hand, the party is demanding a rise in the minimum wage and the substitution of a Capital Gains Tax for some of the tax burden the poor presently carry. These measures would, if implemented, increase the spending power of the working class and - in theory, at least - stimulate the economy in traditional Keynesian fashion. Parker's rhetoric should also remind us of the Lange-Douglas government of the 1980s, which took pride in positioning itself to the right of its National opponents during debates about state ownership of assets and public spending. If the global economic crisis continues and New Zealand experiences the sort of meltdown which has been the fate of Greece, will a Labour government respond by turning to the Keynesian policies of the 1930s, or to the scorched earth neo-liberalism of the '80s? The lack of influence of Labour's few grassroots members over the party's parliamentary wing and the lack of power of the contemporary Kiwi trade union movement make a repeat of Rogernomics a distinct possibility. Parker's revival of the rhetoric of the 1980s certainly shows how little commitment senior Labour MPs have to left-wing principles and policies. As the Greeks are learning, social democratic governments can be the most ruthless defenders of crisis-ridden capitalism. Footnote: Labour offered another bad omen today. Yesterday Skyler, her father and I explored a few of the rutted and pitted roads of Mamaku, that forested pumice plateauland whose strange beauty James Cowan celebrated in a 1929 essay for the wonderful New Zealand Railways Magazine. As we rattled along between stretches of regenerating rimu and doomed radiata, my father-in-law and I swapped complaints about the irrationality of the world. Alan bemoaned the Ufologists, psychics, crystal wielders, reiki-enhanced masseurs, and questers after the lost continents of Atlantis and Lemuria who have infested the Steiner schools where he has spent most of his career; I countered with gripes about Celtic New Zealand conspiracy theorists. We soon reached a comfortably smug consensus about the incorrigibility of human credulity. My father-in-law has been collecting material on what he calls 'delusional thought disorder' for some years, and has talked about writing some sort of grand polemic against the impact of delusion on the Steiner movement. A couple of days before our adventure on the forestry roads of Mamaku Alan had, apparently in the name of research, watched a documentary, or faux-documentary, which attempted to demonstrate the truth of Erich von Daniken's claim that extra-terrestrials not only intervened in human evolution but eventually gave us all of our major religions. He'd been struck by the ability of the Danikenians to balance the weightiest of conclusions atop the most insubstantial facts. After our return from Mamaku to the safety of Hamilton's newly-minted outer suburbs, Alan decided to conduct an experiment in credulity. He uploaded a few of the photos we'd snapped during our drive, made a slide show out of them, added some rather paranoid captions and some spooky music and posted the end result online under the title 'Mamaku Unexplored Forest Oddities Display'. The wreck of the cargo ship Rena on Astrolabe Reef off Tauranga has managed the difficult feat of pushing the Rugby World Cup off the front pages of New Zealand newspapers, as journalists and opposition MPs talk about an 'environmental catastrophe' in the Bay of Plenty. The breakup of Rena and the appearance of oil and dead birds on the Bay's beaches is even set to erode poll support for the National government, if the latest report from ipredict can be trusted. The accident off Tauranga is certainly lamentable. Nobody likes the sight of oil-flecked beaches and dead birds. In context, though, the wreck hardly rates as an environmental disaster. It has closed a handful of beaches, and killed about a thousand birds. But as many as twenty-five million birds are killed by predators - stoats, ferrets, rats, cats, dogs - every year in New Zealand, and whole lakes and streams in regions like the Waikato have been rendered off-limits by pollution from dairy farms. I'd rather try to swim off Tauranga than at Ngaroto, the historic lake southwest of Hamilton which has for years now been infested by noxious weeds fed by the poisons that flow and seep from surrounding farms. National's handling of the Rena wreck certainly seems to have lacked competence and compassion - Steve Joyce, the overburdened Minister charged with responding to the wreck, didn't even turn up in Tauranga until four days after the event - but that is hardly surprising. National has failed to offer any practical response to the impact of the global economic crisis on this country, and its reactions to the Christchurch earthquakes and the Pike River Mine explosion have not been particularly empathetic. Why, then, has there been such an outcry over the wreck off Tauranga? Why is this and not some other issue eroding support for the government? To answer these questions we have to consider the peculiar way many New Zealanders see their country, and the peculiar but not quite unprecedented relationship they have developed with John Key over the past three years. In one of the many caustic asides in his relentlessly amusing autobiography The Gatekeeper, Terry Eagleton mocked the obsession that middle class Westerners have with their health. Eagleton pointed out that the advocates of 'detoxification' and special diets and other fads always present sickness as some alien presence inside the body. 'Health' is, for neurotic Westerners, all about guarding the body against alien intrusion. 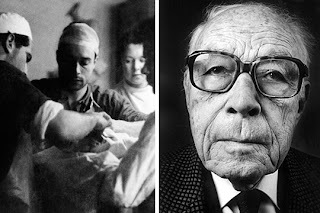 The notions that sickness might be the flipside of health, and that certain illnesses might be inevitable, are anathema to many contemporary Westerners. It seems to me that New Zealanders - Pakeha New Zealanders, in particular - have long had a tendency to think about their island nation as something apart from, and in many respects better than, the rest of the world. This tendency has been encouraged by the relative isolation of New Zealand, and by the way it avoided the foreign occupations and revolutions which were visited on so many other countries at one or another time in the twentieth century. New Zealand is a healthy body, we think, and if it becomes sick, the sickness will have come from outside. During times of crisis the need of Kiwis to think themselves apart from and safe from the rest of the world becomes particularly intense. During the Great Depression of the 1930s New Zealanders developed a deep affection for Michael Joseph Savage, the outwardly amiable leader of the country's first Labour government. Savage's government is remembered nowadays for its progressive reforms, but these measures were largely the work of left-wing Cabinet Ministers like John A Lee rather than the Prime Minister. Savage's popularity came from the kindly, almost avuncular image he projected to voters, and from his ability to assure them that New Zealand would be spared the wholesale destitution and the civil wars which the Depression was inspiring elsewhere. Over the past three years the determinedly affable John Key has managed to be, like Savage, a reassuring figure in a time of crisis. Again and again he has told Kiwis that their country is different from and apart from the rest of the world, and won't suffer the economic meltdowns and social turmoil seen in places like Iceland, Greece and Spain. The idea that economic and political crises might arise in New Zealand because of contradictions already present inside our country - the contradiction between capital and labour, and between the dictates of the market and the needs of communities - seems as alien to Key as it still is to most Kiwis. The wreck of Rena has cast doubt on Key's reassurances of safety. On a practical level, the wreck has shown that twenty-first century New Zealand, with its globalised, deindustrialised and deregulated economy, struggles to deal even with a minor environmental emergency. On a symbolic level, the wreck of the Rena represents the invasion of the healthy body of New Zealand by a dangerous alien. With its dodgy captain, Liberian flag of convenience, low wage Third World crew, and leaking oil, the Rena is the emissary of a chaotic and deeply undesirable outside world. Is it a surprise that the crew of Rena, who were blameless for the mistakes of their captain, were subjected to so much public vitriol and so many threats of violence that they quickly had to be spirited out of New Zealand? The reception given to these men shows us the paranoia and xenophobia which go hand in hand with New Zealanders' sense of themselves as apart from and safe from the rest of the world. The response to the wreck on Astrolabe Reef also shows the fragility of the government's popularity. 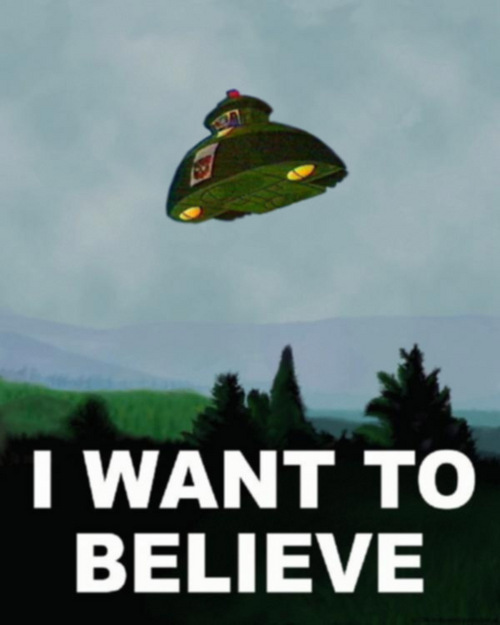 If the public begins to suspect that John Key is incapable of keeping New Zealand safe from alien forces, or if it begins to suspect that New Zealand has its own, homegrown crises brewing, then it will turn on National. [I posted Vaughan Rapatahana's article about his experience at a Nauruan school in the late '70s and early '80s last week. The following article, which I've abridged slightly, was written after Vaughan's return visit to the struggling island-state in 2010, and reveals that, partly as a result of the neo-colonial policies of Australia, the shortcomings of the Nauruan school system have become even more pronounced in recent years. If National Standards is homogenising education and alienating children in the West, then the imposition of an utterly alien curriculum and the refusal to engage with local culture has led to the mass desertion of Nauruan schools. Many things had changed by 2010. Many. Yet, in a sense, many things were still the same. Nauruans remained good people, with what would have to be unlimited patience, given the disastrous economic tsunami that wiped out their salaries and resources for about ten years from 1995-2005, the ramifications of which continue to plague the island. Lots of administrative paperwork and proclamations – many available on the web – had been churned out, with little real, visceral effect, for example the 1995 Nauru Curriculum Footpath, and the 1997 Nauru Education for the 21st Century, whilst politics remained a crazy game of musical chairs between – among others - Marcus Stephen and Ludwig Scotty. A lot of rain had fallen recently, and days were overcast, with only flashes of the diurnal blistering heat I remembered. The airport runway was longer – courtesy of a New Zealand work crew some years before. I had always used to wonder how aeroplanes ever managed to land there without sliding into the sea. - Most Kiribati and Tuvaluans had been returned to their respective homelands in 2006, when it was apparent that there was no money to back-pay them. This repatriation – and their payment – was organized by the South Pacific Forum. 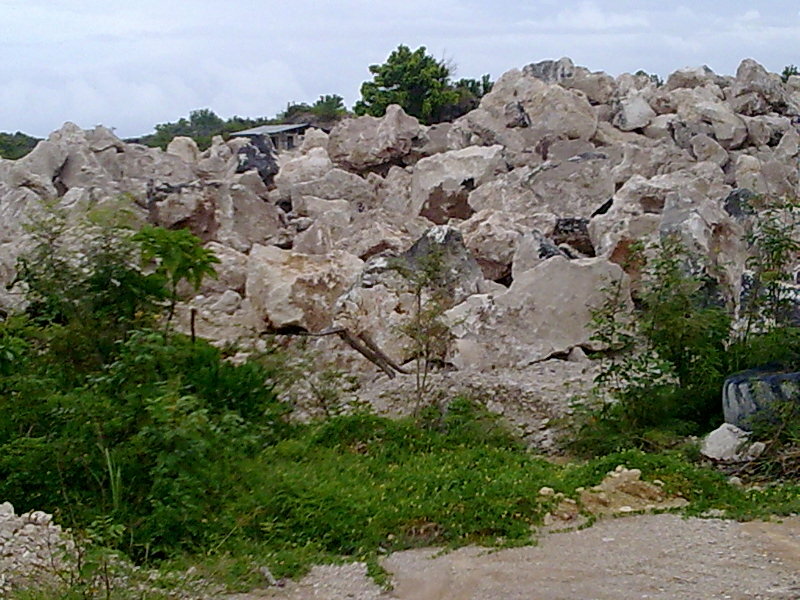 The workers' living quarters had subsequently been taken over by Nauruan residents. - There was no Staff Club anymore – it had been transmogrified into a church. An absurd irony, if you reflect for just a moment. - There was no more Bank of Nauru: apparently money-mismanagement had made it insolvent. - There was no more grocery store in the Civic Centre, in fact not much at all in the Civic Centre these days. The best grocery store by far now is Capelles, which is flourishing and four times its size in 1979 ... it’s also a hotel. And a car hire centre too, or so it says outside. - There is only one aeroplane in Our Airlines, but the replacement for Air Nauru is a fine little airline. I found it very professional, serving very good food with convivial staff ... Actually, Our Airlines does have a second plane, wearing Norfolk Island livery, which is utilized as a charter between Norfolk Island and the Australian mainland. - There is no more expatriate housing, except for some non-European Nauru Secondary School staff, who are put up at the sadly rundown and expensive Menen Hotel. Our lights went off one night and no land line telephones were available – mind you, most people now used mobiles. There was no TV reception whatsoever and an interesting minimalist menu was available, although the food was tasty. - All expatriate homes were returned to Nauru in 2000 and many of the ones the expatriates used to live in - including those in upscale Menen Terrace – are now back in Nauruan habitation. Some houses, however, including the very first home we lived in way back in 1979, were decrepit and overgrown and had no inhabitants whatsoever. - There is also no more Menen channel: now there is a newish (courtesy of Japan) boat harbour there ... I couldn’t swim unhampered by rock pinnacles like I used to, at least in Anibare Bay. The Police Commissioner is an Australian, and I was told that the jail is full. A vicious murder or two had blighted the country recently. In 2004, in return for $22.5million over two years, Australia actually installed a Secretary of Finance and appointed a Police Commissioner … there are very strong shades of re-colonization in the republic nowadays. I even heard further rumours of the current Australian administration approaching Nauru to once more ‘host’ the infamous ‘refugee centre’, the Pacific’s own Guantanamo Bay! New Government House/buildings have been built since I was last there. They are nice, to coin a word. Kayser College now has classes from pre-school (called ‘infant school’ there) through to Year 10. We also drove past a new Nauru College for primary students. I heard later in 2010, that yes, the new school has been reopened on the site of the old school. In 2009, Papua-New Guinean teachers complained bitterly about a lack of consistent salary payment, about being accommodated at a Menen Hotel with no cooking facilities, about racist taunting, about everything being ‘in Nauruan’ language', and about their ‘original’ contracts being abrogated on their arrival on the island. All of this sounded very familiar. Despite the substantive investment in education over 36 years, there is still a huge gap in quantity of trained workers across the various disciplines … At present the reality of the education system is somewhat different from the ideal. The education system in Nauru is failing to produce Nauruans competent to deal with the future. There is a lack of continuity, relevance and of a culturally appropriate curriculum – which, combined contribute to academic failure, loss of identity and sense of purpose. Schools and training facilities are dilapidated and poorly equipped, and there is over-crowding in classrooms. As a matter of fact, significant numbers of Nauruans are illiterate in English and have a poor command of Nauruan. Collaboration between teachers and parents is intermittent … (pp. 32-37). Nauruan is still NOT an official language! There are conflicts over its approved historical version, over its orthography. Perhaps Maori education in Aotearoa could be utilized as an exemplar: Maori have, to some extent, regained control of their education, their mana, via their own language, te reo Maori, as taught by Maori in nga kura kaupapa (schools with Maori subject matter taught in Maori by Maori). However, this model is exactly that – merely a model. Nauru can streamline its own system so as to best support, maintain and nurture into full fruition its own language. It surely must be tino rangatiratanga (total self-determination) time for Nauru. 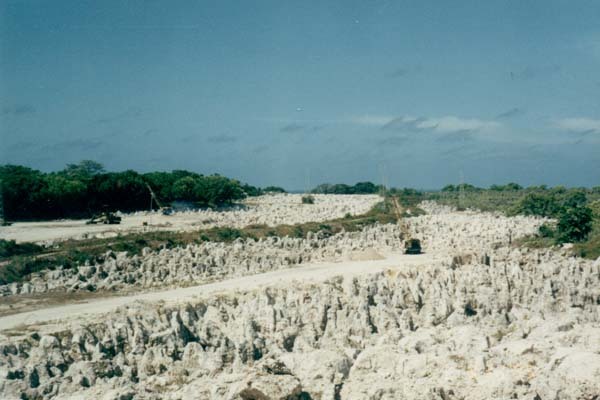 There is an expectation of five more years of phosphate mining and 25 years of secondary mining on Nauru. In early 2010 the Government had stabilized somewhat – despite the possibility of another coup d’etat when we were there, which thankfully did not transpire - and Nauruans now felt the water at about chest level, and not over their nostrils, like they had just a few years earlier, when the country had been listed by the USA as a ‘rogue state’, because the many passport selling and money laundering schemes extant there. Nauruans remain friendly people. When we ran out of gas one afternoon there was no problem in finding someone willing to just drop everything and go and buy some more gas for us – and they had to be almost forced into taking some dollars. I spoke to loquacious (in more than one language), intelligent locals – among them Maria Gaiyabu, Julie Olsson, Tim Angimea, Paul Finch, Chinese restauranters – people who are more than capable of handling their island’s own destiny. My hope is that the Republic of Nauru can remain on its track to stability, that it can gain full control over its destiny, incorporating a system of education of relevance through a medium of relevance. Nauru did not ask for the relentless manifest and latent colonial and postcolonial pillaging of its physical, mental and spiritual resources. 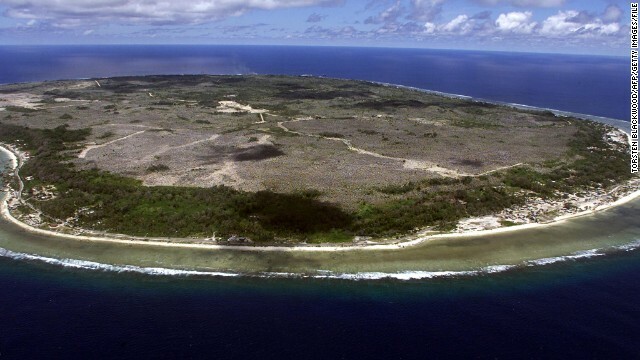 As of now, Nauru remains a signal symbol of rampant neo-colonialist greed. The agents, especially, of the English language are big bad bullies indeed. In his cult 2002 movie The Stone Reader, Baby Boomer Mark Moskowitz told the story of his obsession with an obscure novel he had read in his youth, and of his long journey in search of the author of that book, who turned out to be living as a recluse in a small town in the American Midwest. Moskowitz's search for Dow Mossman wasn't easy, but he did at least begin his journey holding a copy of Mossman's one and only book. The Stones of Summer may have been out of print for decades, but the information on its jacket and on its opening pages guided Moskowitz to a series of people - a publisher, a photographer, a retired creative writing teacher with a passion for greyhound racing - who were able to give him stories about Dow Mossman, as well as offer guesses about the man's location. Since 1997 Anne Amundsen has been searching for a long-lost book and author, but her task is more daunting than the one Mark Moskowitz faced. Anne is searching for a novel she remembers reading in the middle years of the 1980s, when she lived with her diplomat husband in Nuku'alofa, the capital of the Kingdom of Tonga. She remembers the book's locations, and a good deal of its plot, but not its name or author. A friend of Anne recently sent a description of the book she is hunting to the e mail loop of the Tonga Research Group. Because this blog is haunted by bibliophiles - Jack Ross, who has made an online catalogue for his vast private library, and Richard Taylor, who lives and works amidst book-rubble, are both regular commenters - I offered to post Anne's message here, in the hope that she might get the sort of help which made Mark Moskowitz's quest an ultimately successful one. 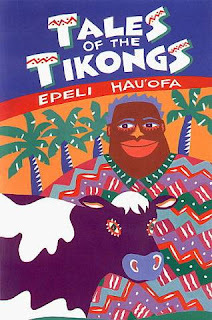 The book I am trying to find was read by me when we lived in Nuku'alofa between 1985-1987 (my husband was the New Zealand High Commissioner at that time). After reading the book, I lent it to a Tongan who did not return it to me, although my husband also read it before it went AWOL! As you will see from the details below, the story was based in Tonga. My extensive enquiries, over the years since, have led me to believe that nobody in Tonga has read this book (apart from my husband and me)! This is surprising, since it was very exciting. Being located in Tonga it is amazing to me that nobody there seems to know anything at all about this book! Any assistance would be enormously appreciated, thank you. 1) It is a NOVEL, not historical fact. Published no later than 1987, but more likely no later than 1986. 2) It is 'located' in TONGA - I think some of the characters 'stayed' at the Dateline Hotel. 3) Some action takes place underwater in the Tonga Trench. 4) Hong Kong somehow comes into the story because in this novel is mentioned my uncle, Captain Bob (Robert) Newton of the 5th/7th Rajput Regiment, Indian Army, who was killed in Hong Kong during the Japanese invasion of 1941. His heroic death, under fire, is chronicled in this book - quite extraordinary, since the book is fictional and about TONGA - not Hong Kong . 5) I think the book is a thriller (or possibly science fiction, though less likely). 6) It has to have been published in 1987 or prior to that (definitely not later). Friendly Isles: a tale of Tonga , by Patricia Ledyard, Vava'u Press 1984 - NO. Night of Error, by Desmond Bagley, St. Martins 1987 - NO. Five years ago the political historian Paul Blackledge published a critique of EP Thompson and the New Left movement in International Socialism, the journal of Britain's Socialist Workers Party. Although I had enjoyed some of Blackledge's writings, I thought that his essay was far too one-sided in its assessment of Thompson and the unstable but energetic movement of ex-communists and student radicals that Thompson helped lead in the late fifties and early sixties. Blackledge seemed to me to be motivated not by a desire to assess Thompson's thought fairly, but by a determination to show that the Socialist Workers Party's political ancestors were the most virtuous and right-thinking section of the New Left. Blackledge seemed, in other words, to be guided by dogmatism rather than by scholarship. I wrote a reply to Blackledge's essay, and that reply wound up as a chapter in my PhD thesis about Thompson, although it didn't sneak into my recently published book on the great man. A couple of years ago the Socialist Workers Party split down the middle, in the time-honoured fashion of far left outfits. A group of former members of the party established a very busy website called Counterfire, where they publish political news and analysis as well as the odd book review (the site's coverage of the burgeoning Occupy Wall Street protests in the US is well worth checking out). Looking at the books page of Counterfire this morning, I spotted a hostile review of my tome on Thompson from a chap named Dominic Alexander. Where Paul Blackledge used the SWP's press to make a strong criticism of EP Thompson, Alexander has used Counterfire to defend the late historian from what he perceives as my relentlessly negative tone. Where Blackledge could see little that was good about Thompson's political thought, Alexander appears to consider it almost faultless. Blackledge and Alexander may nowadays sympathise with different organisations, and they may have diametrically opposed views of EP Thompson's politics, but they seem to me to be guilty of the same one-sided approach to political history. I thank Dominic Alexander for giving my book a read, however cursory, but he does seem to have misinterpreted the attitude I take towards EP Thompson. A closer look at my book would reveal that I have a very high regard for both Thompson's scholarly and political work. Alexander's claim that I'm some sort of ruthless critic out to seize every opportunity to belittle the great man hasn't been shared by other reviewers, including reviewers who were friends and colleagues of Thompson. In her piece for Reviews in History, for instance, Penelope Corfield recommends my book as an introduction to Thompson's achievements. And the late Dorothy Thompson not only assisted with the preparation of my book but considered it a fair overview of her late husband's work. What Alexander seems to object to is the fact that I make any serious criticisms at all of Thompson. He picks up on some of my negative judgments on particular texts and political episodes, takes them out of their contexts, and then presents them as symptoms of a morbid generalised hostility. For instance, Alexander objects to my use of the phrase 'English exceptionalism' at one point in my book. Taking my use of this phrase out of context, he suggests that I've glibly dismissed Thompson's longstanding commitment to internationalist politics and his profound interest in the history and sociology of Third World nations. Alexander notes the way that Thompson invokes the contemporary Third World at the beginning of The Making of the English Working Class, and expresses the hope that the battles which were lost in early modern England might be won in the Third World. I thank Alexander for trying to bring this passage to my attention, but if he reads my book carefully he'll see that I repeatedly cite it, as an example of Thompson's concern with non-English and non-European societies. I use the phrase 'English exceptionalism' not to sum up Thompson's worldview, but in the context of a discussion of his political and intellectual isolation in the aftermath of the collapse of the first New Left in the early sixties. I explicitly contrast Thompson's claim that The Making of the English Working Class is relevant not just to England but to large parts of the world with his repeated claim, in the mid-sixties essay 'Peculiarities of the English', that there is a gulf between English history and the history of other nations. Thompson's undeniable retreat into an exceptionalist position in 'Peculiarities' simply cannot be squared with the optimistic internationalising of English experience which is seen in the opening pages of The Making of the English Working Class. The sort of contradiction I've just noted is found throughout Thompson's oeuvre and also in his life. Thompson wrote with unparalleled power about English history, but wasn't always sure how to relate his historical texts to the present. He was a charismatic political leader, but also a chronic feuder who fell out needlessly with allies. He lambasted the conservatism of English universities, but sometimes struggled to take a constructive attitude to the student protesters of the late '60s and early '70s. He wrote brilliantly about the threats to English civil liberties in the 1970s but had nothing to say about Bloody Sunday and the internment of hundreds of civilians on the other side of the Irish Sea. He alternated between wild political optimism and an almost apocalyptic despair about the future. He wrote majestic prose, but also some dodgy poetry. Faced with the obvious contradictions between the different texts Thompson left behind, and between different aspects of Thompson's life, we have a choice. We can either use one or another variety of dogma to simplify his life and work, or we can try to reconstruct the twists and turns of thought and fate which produced his contradictions, and try to understand which of his ideas we might usefully develop today. Alexander complains that I haven't reproduced the interpretation of Thompson which the Canadian scholar Bryan D Palmer offers in his two books on the man, but if he reads the introduction to my book again he'll notice that I fault Palmer for taking an excessively reverential attitude towards Thompson, and for failing to notice the complexity and contradiction which were part of Thompson's life and work. Palmer's books on Thompson contain much useful information, and their sincerity cannot be questioned, but they do seem to me to verge on hagiography. As I say repeatedly in my book, the left has seen too much of hagiography. The sad case of Karl Marx, whose oeuvre was misrepresented by Stalinists and Cold Warriors alike for much of the twentieth century, ought to alert us to the dangers of producing one official version of a great thinker's career, and ignoring complexity and contradiction. Since the end of the Cold War Marxology and the study of Marxist history seem to me to have flourished, as scholars like James White, Karl Anderson, and Lars Lih have freed themselves from the old orthodoxy which said that Marx's work was all of a piece, and was either completely correct or terribly wrong. They have shown the way that Marx and later thinkers inspired by Marx adopted, developed, and discarded ideas, in response both to political pressures and to research findings. In my own small way, I have tried to do something similar with EP Thompson. And I'd argue that Thompson, like Marx, is relevant to the left of the twenty-first century precisely because his work is dynamic and contradictory. Thompson and Marx are like early explorers, who made maps of the country which we find ourselves traversing today. The maps they left us plot the locations of many key landmarks, but also contain some faulty markings, and many blank spaces which need filling. Thompson and Marx were both aware of how incomplete their explorations were, and it is their intellectual realism, their willingness to retreat from error and recalibrate a theory, their preparedness to leave spaces for others to explore, which distinguishes them from the sort of dogmatic thinkers who produce static, non-contradictory texts. We read Marx's Capital rather than Karl Kautsky's dully encyclopedic opus The Materialist Conception of History precisely because Capital is, in spite of the best efforts of Engels, an unfinished, open-ended work, the record of an adventure rather than a closed theorectical system. The Making of the English Working Class is a collection of passionate case studies, not some attempt at an exhaustive, pseudo-objective map of early industrial England, but its very incompleteness, its refusal of the false confidence of the sweeping generalisation, adds to its vitality. 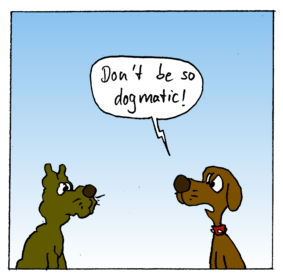 Scholarship is always better than dogmatism. [Last month I posted an interview with Vaughan Rapatahana, the poet, educationalist, and language activist who lives in Hong Kong but considers the small town of Te Araroa near the East Cape of Te Ika a Maui to be his home. After I interviewed him Vaughan sent me a couple of articles in which he reflects on his visits to the Micronesian nation of Nauru. The first article was first published in the Post Primary Teachers Association Journal in 1983; Vaughan has added some asides on recent Nauruan history to it. Vaughan's second article, which I'll post next week, records a return visit to the island in 2010. Yes, I went to Nauru. I went there in April, 1979 to “teach English”. I have never been the same since. I was a young, relatively naïve and inexperienced teacher at a school in the north of New Zealand, who after two and a bit years felt restless, bored, impatient, a little dissatisfied with the sheer racial bias against/ignorance of things Maori. Yet, I had two young children, a fine new schoolhouse with a cheap rental and I enjoyed my job and the company of the teachers I worked with. At least most of them. One afternoon, in the ‘Situations Vacant’ column of the NZ Herald, I noticed an advertisement calling for teachers for Nauru Secondary School, Central Pacific. I applied, probably more in a fit of ennui than anything else, and thought nothing more of it. Later that year I was contacted by Nauru’s Senior Administrative Officer (the ex-Town Clerk of Ashburton, New Zealand). Would my wife and I come down to Auckland for an interview? Sure. So off we went. We asked a few questions, he mumbled a few replies and gave us a large wad of money as expenses. Soon after, I was told that I had the job. After a bit of frantic fact-finding – for few people had even heard of the place – we decided to go. Why not? I gave and served the requisite two months notice, and as a bonus received two year’s leave of absence from a generous school board. We were off. On reflection, I can only say that my motives were greed – good, tax free money on Nauru – and adventure. I guess I’d read too many Biggles books or something. Certainly there was no element of ‘helping the natives’, given that I had a particularly indigenous insight into things anyway. On reflection, I was symptomatic perhaps of expatriates everywhere, although I would like to think that I was more culturally sensitive and aware than most. We climbed onto an Air NZ jet and were whisked away to Fiji for a two-day stopover before an Air Nauru flight to the island. Back then, Air Nauru operated more than the sometimes mechanically bedeviled aeroplanes it now has, although back then also, Hammer deRoubert, the island’s leader, was prone to commandeering planes for shopping trips to Hong Kong, whilst their transient passengers were left temporarily stranded as longer-term tourists on Nauru! My first impression of the 12 square mile (21 square kilometer) island was one of heat: it was bloody hot. A welcome of sorts from a newly appointed Headmaster, from Wellington, N.Z, and we were shunted off to an upstairs flat where a few supplies had been laid on and where the fans only seemed to stir up the heat. This was to be our home for “a couple of months” while our house – in an exclusively expatriate government workers’ settlement on the other side of the island – was readied i.e. painted. We had no car and there was no public transport. There was only one supermarket, which specialized in not having much of anything except weevils, corned beef and a roof that leaked directly onto the counter whenever the infrequent, but heavy, rains came. This supermarket, by the way, had fresh vegetables delivered only once a week – on a Saturday morning – and it was then that a selfish melee used to break out among the expatriates and the local Chinese to be the first to score a cabbage. There was a Staff Club, the bastion of many of the white male population of Nauru, who drank the pink gins served up by one Lee Kit, the fulsomely ever-smiling barman, who knew only enough English to serve the drinks and to mouth obscenities at those patrons who seriously tested his patience during rush hours. Alcohol was extremely cheap: a can of Fosters beer was only 22 cents back then, whilst Fanta was 30 cents. Nauruans scarcely ever went to the Staff Club, whilst Europeans scarcely ever went to the many seaside open bars, which littered the island almost as much as the empty and rusty beer cans they generated. I used to frequent Bill’s Bar a fair bit, however – it was owned and often operated by one of the island’s medical practitioners. Then there was Nauru Secondary School. I was “given” 2B, 2C, 2D and 2E. 2E was very much what they sounded like. 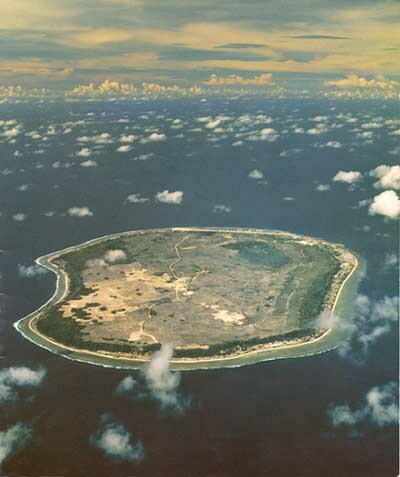 All classes were a mixture of Nauruans, Kiribats and Tuvaluans - with a few Europeans thrown in. 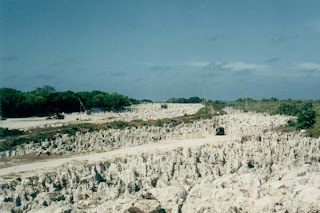 The Kiribats and Tuvaluans were the children of the labourers on Topside (the phosphate diggings on the central, barren plateau of Nauru). They were often the hardest working: they had more to gain, for they had to return to their own economically poorer islands and any education was an advantage to them as scholarships could go their way. Their parents bore the brunt of poor living conditions on the island – they often had small flats with no power and water (and more recently, during a few economically destitute years in the Republic, they had no money either, as there has been none to paid them - nor to the white expatriates, for that matter). As for the Nauruan students – they covered a wide spectrum, although the most academically left on scholarships to Australia, and the scions of the wealthy elite (generally politicians) were sent away to study in expensive boarding schools. That left some very bright and very diligent students, some bright and diffident students, some bright and psychologically ‘maladjusted’ students, and some non-existent students. This latter group was the quite large truant student body. I saw one pupil attend class only twice during the entire time I was at the school. Always it was hot. Only the science ‘labs’ sometimes had air conditioning. There was no one room for me that first year. I had to chug my way around various, often dilapidated, often filthy classrooms, with the few resources that made any relevant sense, or that were complete. I stumbled over the truant student body in all manner of bizarre places, often with a disgruntled teacher or Acting Principal/Acting Deputy Principal (everyone in Nauru seemed to be ‘acting’ something or other!) in hot pursuit – sometimes through and over the graders and trucks and diggers in the adjacent Ministry of Works. Discipline, at least initially, was through physical intimidation. Nauruans respected strength and ‘macho man’ tendencies. And always, right outside the school, was the airstrip. Everything stopped as we watched planes rumble on and off the tarmac, whilst we, perspiring profusely, wondered if this would be the plane that didn’t actually land or take off on time. More than this though, the curriculum failure was due to the fact that those at the top were unwilling to take effective control. The Nauruan hierarchy wanted, or had been persuaded to support, a system based on the one that operated in the Australian state of Victoria, as many of them had won their own scholarships to that state in their early years. But the Victorian system was irrelevant to Nauru, and in particular to its one secondary school and the one private Catholic Kayser College. What was called for was a uniquely Nauruan curriculum, incorporating, for example, Nauruan language, which was slowly being lost along with other aspects of the culture like songs, dance and weaving. Indeed the Nauruan language was then scarcely extant in any comprehensive written form. There were infrequent examinations and reports. There was officially no corporal punishment: the Principal’s only official, and ‘ultimate’ punishment was a one-hour suspension! There was, at times, chronic vandalism of the classrooms – inside and out. There were no playing fields, no gymnasium. There was frequent theft of equipment from most departments – not always by students, as certain expatriates hoarded and dispatched large treasure troves homewards. There were occasional physical threats, and once or twice these came from pupils against staff. Because of the constant toing-and-froing of Headmasters – including the guy who had greeted me –there was often no leadership. In my two-and-a-bit-year stint, there were five Principals or Acting ones or Deputy ones – everyone had a turn, even me, by my second year, when I was already H.O.D. of English (my predecessor in that role, the wife of the Principal who met me, had found everything “too hot”). Everyone had a turn. Some were efficient, some the complete opposite. We, as a staff, never really knew what was going on. Dawson Murray, for example, arrived mid-1980 and immediately the whole school (remembering that the other schools on Nauru, i.e. infant and primary, were mirror images of Nauru Secondary School) took on a more positive tone. N.S.S was repainted, repaired and its ‘difficult’ pupils were dealt with. However, Dawson was sacked quite soon afterwards for ostensibly being too critical, and maintaining too high a profile. The Nauruans are a proud people and, after years of sublimation by Europeans - initially by Germans and later by Britons, Australians and New Zealanders - they were independent, and felt no desire to have their former ‘masters’ and plunderers of the phosphate criticise, albeit helpfully, their system or lack of it. After Dawson went, having been given two days’ notice (as were others later), things returned to the norm of absenteeism amongst pupils and staff, and the frustrations of trying to get some guidelines from senior administration in the Government offices right next door. We returned to coping as best we could. Remember that English was the second language for most pupils and the first for most of the staff: some pupils were illiterate in English. By the end of our first year, we had come to grips with the ‘way of life’. School wasn’t too bad and the money – comparatively – was good, so we bought bourgeois possessions like a new car, a waterbed, a new stereo, exotic furniture and so on. There was no import duty or sales tax and consequently plenty of kitsch things to spend one’s money on. We could go to the ‘beach’, in reality a bulldozed channel through the rocks, or go snorkeling over the reef to the tepid deeps. There was plenty of socialising and copious parties, although it was noticeable that there was little intermingling with the local community, other than getting Kiribati baby-sitters. The mail order catalogues were abundant and the houses weren’t too bad. One either adjusted or blew up and got off the island as soon as one could, although many expatriates had overextended themselves financially and were thus forced to stay longer than they would have liked. 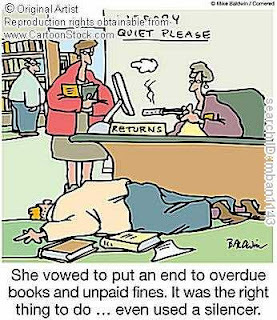 (At least they knew they would be paid – it is far different there now!) Still, there were also quite arbitrary contract changes, one of which ensued at the end of 1979 when the contractually assigned three months’ leave was cut back to two months. If we didn’t accept this we were ‘down the road’. Some took that route, thankful for their escape. Over 8,000 people on a tiny island can indeed get to you and we were only manuhiri (guests) after all! As noted earlier, I became Coordinator of English in 1980, mainly because I was the only suitable applicant for the position and I had to draw up the school timetable for that year. It needed constant restructuring, however, due to class closures and staff disappearances. Here I was, at 26, being involved in aspects of school administration that I would not have been exposed to, nor involved with, in a New Zealand situation for years or, indeed, at all. Bizarre? No, not really – this was just Nauru. And this is the crux of the whole matter. You see, there were/are always two cultures rubbing against each other in every aspect of life on Nauru Island. Over the years I have noticed similar culture clashes in stints in other places, such as Brunei Darussalam, UAE, PR China, Hong Kong and the East Coast of Aotearoa-New Zealand. On Nauru, the disparate cultures rarely gelled. There was a contrast between on the one hand the WASP New Zealand culture of most of the teaching staff and their heritage of British-styled exams, curriculum, discipline, resources and on the other hand the far more laid-back resignation of the students, the few Nauruan staff, and the educational hierarchy. Here were two distinctly different ways of seeing, conceptualizing, prioritizing, of Being. The Nauruans had seen Europeans – and the odd Maori – come and go forever. They (the Nauruans) were still there. It was always hot and siesta time was a daily event. 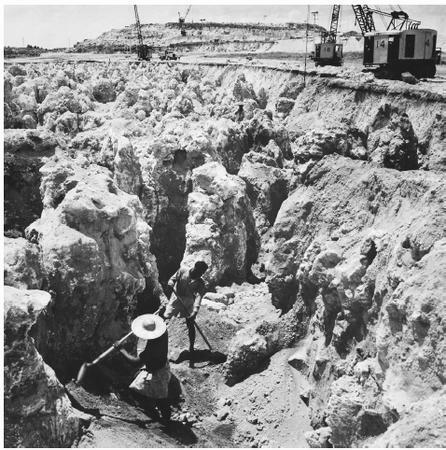 They were – then – generally well off, although the phosphate royalties by no means trickled down to all Nauruan families and there was – even then – resentment that Europeans had taken a lot from the island prior to Independence – and since, unfortunately. By the time I left, hostility toward expatriates was growing increasingly manifest. They were, in some cases quite justifiably, the scapegoats. The fact that among the Nauruan youth were some extremely competent future leaders who were not being catered for, just didn’t seem to hit home. “It doesn’t matter” was the expats’ catchcall. I left in 1981, a wiser chap. I learned from mates still there into 1982 and beyond some grotesque stories about the Principal’s car being burnt out and more two-day notices and so on. I wondered for a while if the English Department still had peeling walls and if they had new holes in them … But then Nauru receded in my mind as I strove to do other things and I had a whole raft of other experiences in other places. First published in the PPTA Journal, Term 3, 1983, pp. 30-33. The readers of this blog are obviously prescient. Just over five years since he won a bottle of that venerable Kiwi beer Old Thumper after topping a poll here poll for the title of Greatest Living Writer, seeing off competition from the likes of John Ashbery and Jack Ross, Tomas Transtromer has been awarded the Nobel Prize for Literature. I admit to voting more than once in 2006: Transtromer is one of my favourite living writers, and I feel evangelical about his work. Whenever I meet Swedish tourists at a bar or a backpackers' hostel I pester and puzzle them with questions about how the great man's texts look in his native language, and I've posted a number of Transtromer poems on this blog over the years with short commentaries (see here and here, for example). I dragged Transtromer into the introduction I wrote to Ted Jenner's collected writings a couple of years ago, and I recently pinched one of his greatest lines for one of my own poems. I'm delighted, then, that the Nobel Committee has followed the lead readers of this blog took back in 2006. 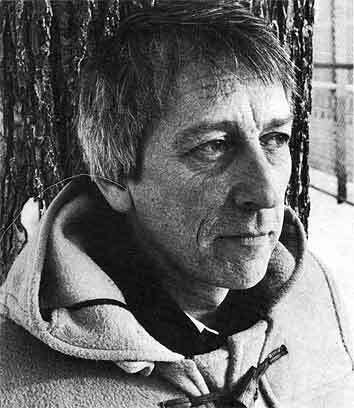 Swedish literature has become synonymous in many minds with disposable crime novels, but Transtromer is only one of a number of great modernist poets the country has produced - his haunted predecessor Gunnar Ekelof has been discussed here - and the 2011 Nobel will hopefully open doors to this wider body of work. The new Nobel is a win not just for Transtromer and other Swedish poets but for poetry itself. No poet has carried off the award for fifteen years, and I've argued that in the twenty-first century the methods of poetry are inreasingly at odds with an aggressively philistine media and with the way that the internet is being 'developed' by corporations like Google. By rejecting easy, populist options like the novelists Cormac McCarthy and Philip Roth and plumbing for Transtromer's intense and sometimes demanding oeuvre, the Nobel Committee has reaffirmed the importance of poetry to culture. The University of Auckland, where I was institutionalised for many years, has put a plug for my book about EP Thompson on its website. I'm pleased that my alma mater is prepared to associate itself with my name, but I'd be even happier if the university would consider voiding my library fines, which were, by the time I graduated, about as large and as intractable as Greece's foreign debt. How about it, folks? Nowhere between the northern tip of Ponui Island and Onepoto bay in the Coromandel does the depth of water in the Firth of Thames exceed 35 metres. Given the very poor environmental state of the water in the Firth I have always been of the view that a land reclaimation along the lines of the Zuiderzee Works would produce an outstanding economic outcome, creating many tens of thousands of hectares of valuable new farmland, mining opportunities and urban development. THAT is the sort of public works project that would be good for the working people of this country!!! Sanctuary's suggestion is not quite as surreal as it might at first seem. Ten thousand or so years ago, during the last major Ice Age, the Firth of Thames was a swampy plain, and much of the adjacent Hauraki Gulf also sat above the sea line. After the sea advanced, creating the Firth and making the Motutapu and Waiheke Hills into islands, a huge swamp remained beyond the southern fringes of the new shoreline. The Tainui peoples - Ngati Maru, Ngati Tamatera, Ngati Paoa - who settled this region built islands in the midst of the swamp by dumping shells and gravel stones moved by canoe from the beaches on the eastern side of the Hunua Ranges. In the early twentieth century, after the alienation of Maori land and the felling of the kahikatea which grew in the swamp, the ancient reclamation project was resumed on a massive scale. Using dredges, drains, canals, and pumps, the government of William Massey turned the marshes into a new region they named the Hauraki Plains. In 1915 alone fifteen thousand acres of swamp were turned into dry land and sold to farmers. The public works scheme Sanctuary suggests might seem implausibly vast but, when we take into consideration improvements in technology, it is not qualitatively different to the scheme which Massey launched a century ago. The National government is anxious to avoid anything resembling a Keynesian stimulus programme, and has deemed even the national cycle trail John Key mooted before the last election too extravagant a project to pursue seriously. Even if National had decided to respond to the global recession with a sort of New Zealand New Deal, it's not clear what the point of large-scale land reclamation would be. Land is hardly scarce in New Zealand, and rural regions like Eastland and the King Country have for decades suffered from ebbing populations. Land reclamation may be an unsaleable idea in this country, but it seems to be attracting an increasing number of enthusiasts in England. 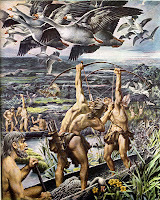 At about the time that the Firth of Thames was formed, the North Sea consumed Doggerland, a region of swampy plains and low hills which had connected eastern England to continental Europe for tens of thousands of years. 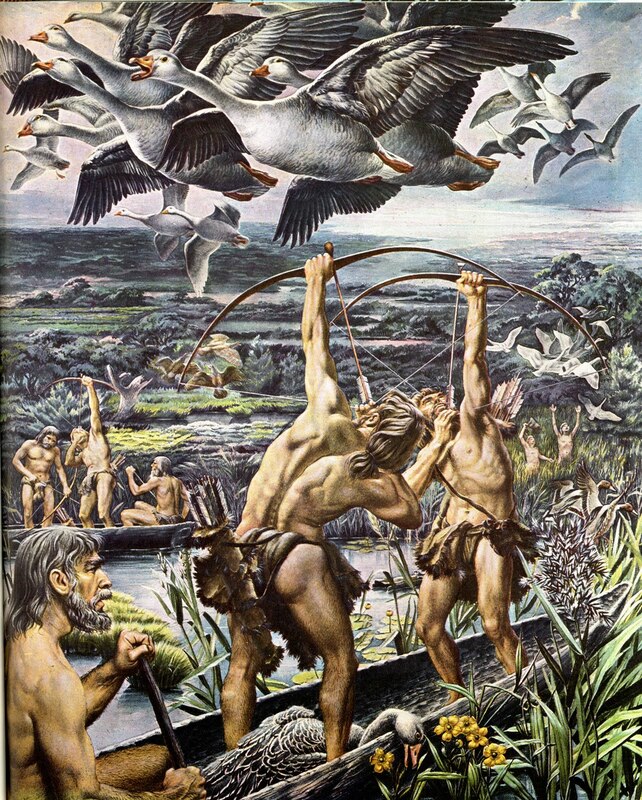 The Mesolithic peoples who had lived in Doggerland were scattered, but the axes and adzes they used to hunt and cut up tigers and mammoths still turn up regularly in the nets of North Sea fishermen. The fate of Doggerland is hardly unique. Many peoples have legends of catastrophic floods, and marine archaeology is a prospering academic discipline. Despite its relatively short human history, New Zealand has lost settlements to the sea. Oral histories suggest that the Kaipara Harbour island of Taporapora, which was famous as the final resting place of the Manuhuhu waka and the site of an important school of learning, was destroyed by a huge wave hundreds of years ago. A low-lying region of kumara gardens and villages called Paorae used to extend into the Tasman from the southern head of the Manukau Harbour, but it was gradually reclaimed by the sea, and had disappeared completely by the middle of the nineteenth century. The inundation of Doggerland might not be unparalleled, but the amount of land which was lost is exceptional. The region covered an area larger than the present-day Netherlands, Belgium, and Denmark combined, and contained hundreds of settlements. 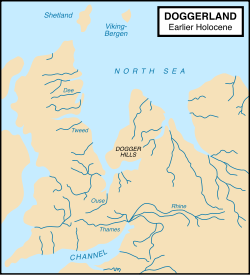 The name Doggerland was only coined in the 1990s, when serious archaeological study of the region was beginning, but it is already widely recognised. Europe's Lost World, a study of the region and its disappearance by a trio of archaeologists, became a bestseller last year, and the popular television series Time Team devoted an episode to Doggerland. The fantasy writer Stephen Baxter has written a series of novels set in Doggerland at the time when the North Sea began its advance, and New Age websites have begun to refer to the region as 'Britain's Atlantis', and to credit its ancient inhabitants with all sorts of mystical insights and supernatural powers. If Doggerland does have a right to exist, where would it be? Of course under the North Sea, for the most part. On the coasts around the sea, however, centuries of land reclamation have taken place. Great swathes of Holland, East Anglia, Frisia, Flanders and Jutland have been created through digging dykes and dredging the seabed. As is evident in Happisburgh in Norfolk or on the island of Sylt, the sea is all too willing to get these places back. Nation states have to build coastal defences to keep hold of these lands. If they didn’t, they would presumably be subsumed back into the sea. So surely you could argue that these places should, by right, belong to the North Sea – and, if so, to Doggerland – and not, therefore, to the Netherlands, to the United Kingdom, to Belgium, to Germany or to Denmark. The massive network of dykes and pump-stations and polders which would be required to reclaim Doggerland from the North Sea could only be funded by a national government, or by a supra-national body like the European Union. The would-be Doggerlanders apparently expect European governments to pay for the 'recreation' of 'their' nation, and then to give up all claims to the new entity. Would it be going too far to suggest that both the romanticising of ancient Doggerland and the brave visions of a recreated Doggerland can be related to the peculiar malaise in which contemporary England finds itself? The twentieth century saw the decline of Britain as a world power, and the rolling up of the British Empire. The Blair era seemed for a while to represent the revival of the old expansionist Britain, but Blair's adventures in Afghanistan and Iraq now seem, like the failed invasion of Egypt in 1956, to symbolise the inability of modern Britain to project power successfully abroad. The decline of British imperialism has been complemented by the fracturing of the British nation, as Scotland, Wales, Northern Ireland and even Cornwall assert their sense of difference from England. As the very idea of Britishness loses credibility, the English are increasingly having to ponder their own history and identity, and to contemplate the possibility of a future apart from Scotland and Wales. Perhaps Doggerland appeals to some English minds because it offers a romantic escape from an unglamorous and uncertain present. With its vague, almost mythical quality and tragic fate, ancient Doggerland is reminiscent of the idealised pasts sometimes promulgated by Celtic nationalists. It offers an alternative, or a pseudo-alternative, to narratives which present the English as an oppressor of other peoples. With its promise of winning new territory without wars, The Doggerland Project appeals to citizens of a small and crowded nation who are aware of the impossibility of reviving their old martial empire. Even as scholars labour to reconstruct its contours and culture, Doggerland is becoming a site for fantasies.